The basic report gives the scores in each category. This is great. I can look and see how each platform did in an individual category. This allows me to look to see which product may be right for me. Alfresco is included and considered a credible contender. For a company as young as Alfresco, that isn’t bad. Heck, they got an analyst to even rank their product. That is noteworthy all by itself. Old versions. This isn’t their fault and is just a matter of timing. Next year, someone else will have a major release near the cutoff date and will benefit. If a product wasn’t released by April 2007, it wasn’t evaluated. This helps those with major releases around then, such as Alfresco with its release of 2.0 in February. Incorrect versions. Forrester does need to get a clue here. They say Documentum 5.3 was released in March 2007. THERE WAS NO RELEASE IN MARCH 2007! 5.3 SP4 was released in December 2006 and the core 5.3 was released in March 2005. I wonder about the accuracy of the other vendor release data. Vignette was the only one without a score of 5 under miscellaneous. They got a 3.68. No details in the copy that I have as to why. I can’t believe that everyone else got a 5. Did the analyst actually try and use all of the documentation and training, or did they just see if it existed? A bigger question is, “Who did Vignette piss off to not get a 5.00?” Maybe they got knocked on internationalization, but I just don’t see it. Note the relationship between Microsoft’s Strategy and their actual Offering. EMC: Documentum Content Server and eRoom. IBM: FileNet, Content Manager, and Lotus Notes. OpenText: Livelink and Hummingbird (eDOCS). I didn’t even break a sweat on that. Now, they evaluated the first product suite listed for each one. SHORT SIGHTED!!! If a vendor doesn’t have one platform for everything, then they should get docked. If they can’t merge the platforms, or don’t plan to do so, dock them on Product Strategy as well. From what I can tell, Forrester had nice expensive dinners with each of the big vendors. Over brandy they decided to wear blinders when deciding what to evaluate. As far as I am concerned, this calls every score into question. If you are going to evaluate a vendor, then do so. If you are going to evaluate a product, then do that. Don’t do one and call it another. For the record, I’m not saying that Gartner is any better. I didn’t see any breakdown of their scores, so they were spared this scrutiny. 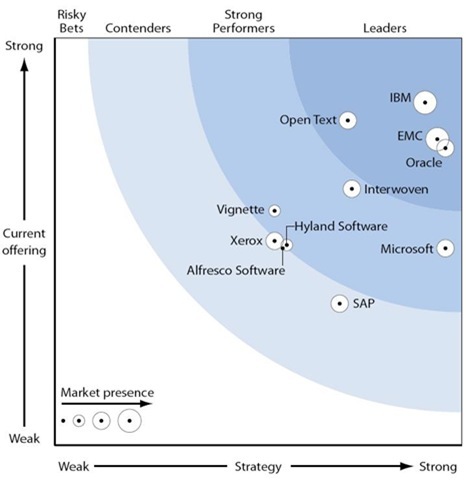 Any thoughts as to why IBM is placed slightly ahead of EMC in both Gartner and Forrester. Please do let me know if you have discussed it in earlier blogs or forums. From what I can tell, they like Lotus Notes, IBM’s better Information Management suite, and they have traveled further down the SOA road. The two key factors are Breadth of the ECM offering (40%) and the Extended Capabilities (20%). However, if you look at my note, you can’t really count Lotus as it is a separate application. FileNet has had a lot of problems delivering since the P8 suite came out years ago. If anyone can turn it around though, it will be IBM. The other two, more significant, long-term, threats to EMC’s “leadership” are Oracle(Stellent) and Alfesco. Oracle has the right strategy and just needs some breadth. Alfresco just needs more time to add capabilities. By your comments on Forrester’s report, it’s amazing you actually spent the time to review it. Blogs will/have become the reviewer of my own choice. I’ll leave the reports to managers who need to build slide decks from the graphics and sound bites. This was the first to really talk about Alfresco, I had to dive into it. Besides, these reports do have some value as long as you read deep into them. Besides, if my clients take these reports seriously, I have to at least know what they say. Clients find waves and Quadrants simple and fast ways of assessing product’s standing in the market. Hence it becomes a consultant’s action item to be in sync with these reports. However,i still feel these reports are not transparent.For instance,there needs to be mention of existing client satisfaction index over product he is using.There should also be number of clients who have migrated from one ECM to the other and why. I still cant get what SAP doing in waves and quadrants. Thanks for the courage to post this. I know of two different organizations that based their purchase decisions principally on the Forrester Report you cite above. It is not easy to take the influence of vendor salesmanship out of these analyses. While I wasn’t a fly on the wall of the steak and brandy dinners you cite, I can confirm that some product vendors do try to offer our consultants these ‘benefits’ to influence decisionmaking. I cannot emphasize enough the need for the customer to gather requirements that are meaningful to the business needs prior to looking at product (or vendor). Through a well-organized and thorough procurement process, the customer can end up with the product and vendor relationship that fits best for that customer’s business needs. The side benefit of that process is a better understanding by both the customer and vendor of exactly what they’re getting themselves into. The Forrester and Gartner reports are just one set of tools that the customer can use during the procurement process. I’m sure that in both organizations, the analysts are trying to do their best to report objective data. However, both organizations should take especial care to double-check assertions in these reports in consideration of the fact that customers often have blind trust in the research. I think Forrester should hire you or another industry expert with some cojones to BLOG about the flaws in their content. Someone needs to help these people improve their game! In your view is Documentum a serious solution for Web Content Management, or as Tom Byrne sez over at CMS Watch is WCM distinct from ECM? Kathy, that really depends. For larger organizations, I would say that WCM is an essential part of the entire ECM strategy. However, Documentum’s WCM offering is not leading the way. For smaller companies whose needs are focused purely on WCM, I would focus on pure-play WCM vendors. Only when an organizations requirement also need collaboration, Retention, and other Content Management Applicaitons do players like EMC and IBM come into play. One day, hopefully, the WCM Content Applications will be able to plug into Documentum or their own repository. I’d like to see those layers separate.